There’s just something about a movie where the underdog accomplishes something amazing against all odds. You find yourself rooting for them along the way, anguished by their every set-back and completely inspired by the time the credits roll. 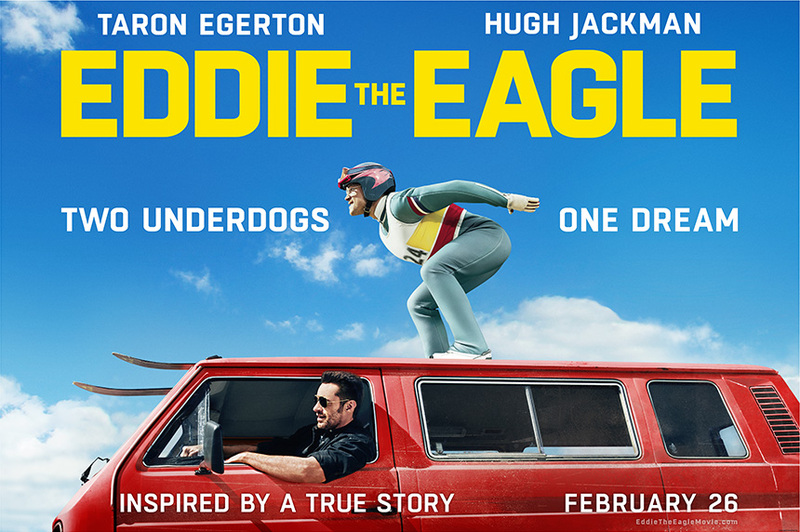 Such is the case with the upcoming new film, “Eddie the Eagle,” about real-life British ski jumper Eddie Edwards. Despite early childhood health challenges, financial status & an untraditional athletic “look,” Eddie (played by Taron Egerton) dreams of becoming an Olympian. Behind his thick glasses and bushy mustache, there is a crazy amount of determination brewing. This internal motivation is impressive; after being kicked off the British downhill ski-team, he takes up ski jumping when he discovers Britain hasn’t had representation in the sport since 1929. With no prior training, and facing opposition from everyone around him (except his mother, whose devotion brought tears to my eyes), Eddie sets out for Germany to learn how to ski jump. There he meets Bronson Peary, played by the always-gorgeous Hugh Jackman, a one-time ski jumping champion in need of a little inspiration himself. Their relationship was fun to watch, and by the end of the film, you could tell that they’d both learned a great deal from each other. By the skin of his teeth, Eddie qualifies for the 1988 Winter Olympics in Calgary. During competition, Eddie beats his personal best jump (though still not good enough to medal), then goes for the 90-meter jump which he’d never tried before. All because he wasn’t afraid to give up and give in to everyone who said he didn’t have what it took. As a result, the Olympic crowds fall in love with him and his enthusiasm for the sport. I wasn’t familiar with Eddie Edwards before, but I’m so happy to now have a sense of this man’s story. Determination is a powerful asset. I really enjoyed this “feel good” film and have a feeling you will, too. 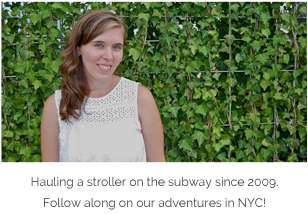 Disclosure: This post is sponsored by Eddie The Eagle through their partnership with POPSUGAR. 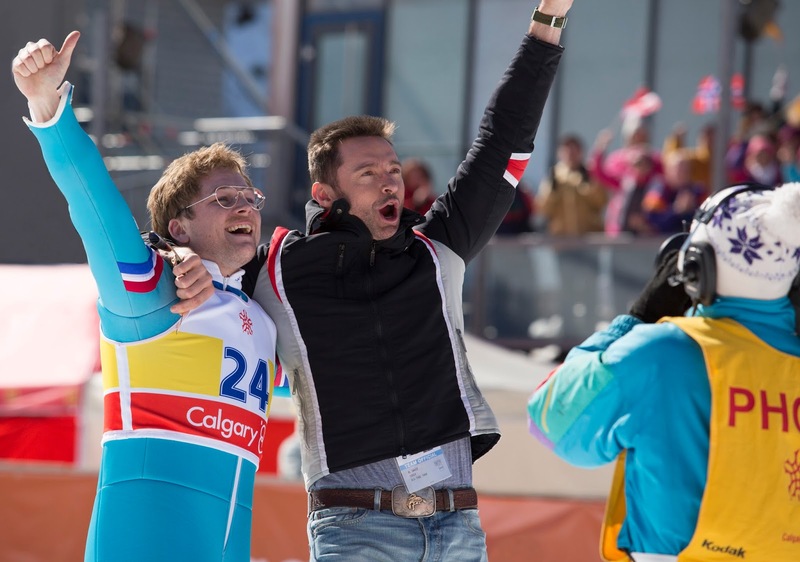 While I was compensated by POPSUGAR to write a post about Eddie The Eagle, all opinions are my own. This looks like such a cute movie - perfect for snowy winter weekends! This movie snuck up on me and cannot wait to take the family. I adore sports movies. This is definitely going on my list! Looks like such an inspirational movie! Can't wait to take my kids to see it!